The Monarch butterfly, a beautiful insect known for its orange and black markings, is famous for its annual migration to the highland forests of Michoacan, deep in the heartland of Mexico. Each year, hundreds of millions of butterflies travel from the United States and Canada, to winter in forests of Fir and Oyamel trees. Those butterflies that survive the journey, which in some cases amounts to a 2,000 mile trip, cluster profusely in trees, creating a marvelous sight. Near Morelia, the capital of the state, is the Santuario Mariposa Monarca (Mariposa Monarch Sanctuary), a reserve dedicated to protecting their environment. Allocate a day's travel to reach the sanctuary from the city of Morelia. Each year, starting in late October to early November, the butterflies start to arrive. Incidentally, this time period coincides with the Dia de los Muertos (Day of the Dead) holiday. The indigenous peoples of the area believe the butterflies represent their departed loved ones souls, returning in the form of the butterfly. During the evening hours, the insects gather on tree trunks and branches. After morning arrives and the heat begins to rise, the butterflies begin flocking to the forest floor, creating a tapestry of orange and black as far as the eye can see. Starting in March, the butterflies begin to mate and the pregnant females start their journey north and the cycle begins again. What is amazing to note is it takes from 4 to 5 generations of butterflies to make the journey from the northern regions to Mexico. Those butterflies that do successfully arrive, actually are the great grand-children so to speak of the journey's first butterflies. Weather conditions can adversely affect the butterflies' journey. 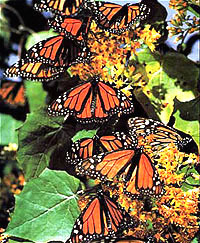 In 2002, a devastating storm struck central Mexico, with inundating rain and freezing temperatures proving fatal to large numbers of Monarchs (an estimated 250 million insects perished). Thankfully and perhaps miraculously, the following year, between 200 to 500 million butterflies returned. However, illegal logging continues in the forests that these butterflies travel to. Without the trees, no miracle can save these wonderful creatures. The local farmers, with their focus on day-to-day survival, cut down the trees unconsciously, to clear the land in order to plant corn and raise livestock. Organizations are in place that work with the farmers, providing education and incentives to dissuade them from cutting down the trees that the Monarch butterflies call home. The hope is that a self-sustaining eco or rural tourism can be developed that allows for the local population to benefit indirectly from this natural wonder. Note: The greatest present danger comes from outside loggers who illegally harvest timber which is later hauled out using a network of clandestine roads. Since the people involved in the illegal logging are often armed, the local people have found it necessary to ask for federal intervention.